'Trampled Under Foot' (also sometimes written as 'Trampled Underfoot') is a song by English rock group Led Zeppelin, featured on their 1975 album Physical Graffiti. 'Trampled Under Foot' is John Paul Jones' classic Clavinet track, and it was one of their best songs when played live. The song was written by Robert Plant, Jimmy Page and John Paul Jones, and evolved out of a jam session in 1972. The lyrical theme were inspired by blues musician Robert Johnson's 1936 'Terraplane Blues.' A Terraplane is a classic car, and the song uses car parts as metaphors for temptation—'pump your gas,' 'rev all night,' etc. Much rehearsal went into perfecting the relentless semi-funk riff that dominates this song. John Paul Jones has alluded to Stevie Wonder with part of the inspiration for the beat, which he played on a Hohner Clavinet D6. The song begins with the Clavinet part, and its heavy, driving 'stomp' rhythm pushes the song throughout. It is fairly simple, but leaves room for the fascinating guitar effects. The Clavinet solo is an energetic and busy chordal improvisation. As the solo plays, a second Clavinet track is added, a dark, muted sound that was created by running the Clavinet through a wah-wah pedal set back to a very low range. On the studio version, Jones played electric bass guitar; live, the steady bass part was replicated on his floor bass pedals. Backed with a solid backbeat from Bonham, the song would later be sampled in dance remixes and the BBC television programme the Old Grey Whistle Test, synchronized the song with a black and white filmclip featuring dance hall girls. Guitarist Jimmy Page played wah-wah and, as producer, employed backwards echo on the recording. 'Trampled Under Foot' was frequently played on the radio when it was first released, charting at #38 on Billboard's Hot 100 chart. Led Zeppelin did not release any singles in the United Kingdom until 1997, when 'Whole Lotta Love' was released 28 years after it was written. There were several pressings made of 'Trampled Under Foot' as a single in 1975 in time for the band's Earl's Court concerts, but they were all shelved before being released, and are today highly sought-after collectors items. 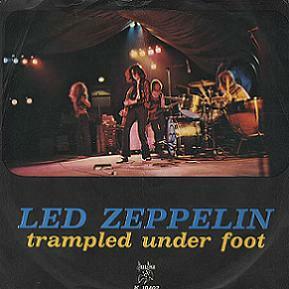 'Trampled Underfoot' became a standard part of Led Zeppelin concerts from 1975 onwards, being played on every tour until 1980. It was also performed at Led Zeppelin's reunion show at the O2 Arena, London on 10 December 2007. When the song was played live, the band would often extend it with lengthy guitar and keyboard solos, and sometimes segue it into the song 'Gallows Pole'. One of Plant's favourite Led Zeppelin songs, he sang it on his 1988 Now and Zen tour, and also at his daughter Carmen's 21st birthday party in November 1989, with Jason Bonham on drums. Along with 'No Quarter,' 'Trampled Under Foot' showcased Jones' skills as a keyboard player when performed on stage. A notable example is the version played at the Earls Court Arena in 1975, as featured on the Led Zeppelin DVD, which includes an extended solo by Jones on a Hohner Clavinet D6. It is also notable that Plant rarely sang all the different verses of the song live, and sang a verse (with small alterations sometimes) twice or even three times. ↑ Godwin, Robert (2003). Led Zeppelin: The Press Reports...., Fourth. Burlington, Ontario: Collectors Guide, 321. ISBN 978-1-896522-41-8. ↑ Lewis, Dave (2012). Led Zeppelin: From a Whisper to a Scream. London: Omnibus Press, 69. ISBN 978-1-78038-547-1. ↑ Godwin, Robert (24 August 1990). "Led Zeppelin: Alchemists of the '70s". Goldmine: 13. ISSN 1055-2685. ↑ Snow, Mat (December 2007). "The Secret Life of a Superstar". Mojo: 82. ISSN 1351-0193. ↑ Rosen, Steven (July 1977). "Jimmy Page Interview". Guitar Player. ISSN 0017-5463. Retrieved on 4 May 2014. ↑ Top 500 Tracks - 1999. Radio Caroline. Retrieved on 4 August 2013. ↑ The 100 Greatest Recordings From 1975 - 2007. DigitalDreamDoor. Retrieved on 4 August 2013. ↑ Hot 100 Singles - 17 May 1975. Billboard. Retrieved on 4 August 2013. ↑ Top 100 Singles - 31 May 1975. Cash Box. Retrieved on 4 August 2013. ↑ Top 40 for 1975 - May 1975. Record World. Retrieved on 4 August 2013. ↑ RPM Singles Chart - 31 May 1975. RPM. Retrieved on 4 August 2013. This page was last modified 08:33, 4 May 2014.